If you are in search of the biggest thrills playing Blackjack then live dealer Blackjack could be right up your alley. Top 10 Casino Websites brings you top calls live dealer sites where you get the best of both worlds, i.e. playing in a real land-based casino but right from your desktop, laptop or mobile. Racing to 21 or rather beating the dealer in the race to 21 is even more fun and exciting when you switch over to the live dealer version. In fact, you get better real casino experience since you have a live dealer in attendance and get to see the dealer and the cards being dealt while you play against other players and even interact with them. If you’ve tried your hand at online blackjack then live dealer blackjack is no different except for the fact that the game is conducted by a real life dealer in a complete casino setting, which is truly the icing on the cake. The games are streamed live from the casino or software provider’s studio with a dealer standing by at all times to help you join a table and place bets. Throughout the game you will be able to see the dealer, the cards being dealt out of the shoe, bets placed, and much more, all in real time. Once the game commences you will be dealt cards following which you can stand or hit. All it takes is a bit of luck to win and cash out a tidy sum. Not only our experts but anyone who has checked out live dealer blackjack tables will tell you it is one of the most thrilling ways to soak in a real casino experience from your desktop or mobile. The game is played with the same rules that are more or less consistent no matter what variant you play. Live blackjack is played with a single or more decks of 52 cards where the objective is to beat the dealer’s hand with a hand value as close to 21 as possible. Once you have funded your online casino account you can head straight to the live dealer section and choose one of the blackjack variants. You can join any available table. Place your ante or initial bet: You begin by placing your initial bet or ante first. At a multi-seat table your ante will have to match the other players. We always recommend that if you are new to blackjack, start with a small bankroll and then slowly graduate to higher bets. Dealer distributes cards: Once you have placed your bet or if all the players have placed their bet in a multi-seat game, the live dealer will deal two cards from the shoe to each player. One card will be dealt face up and the other face down. Choose to hit, stand, split, double or insure your bet: After the cards are dealt you will have either hit, stand, split, double or insure your bet. You will be able to see your hand and one of the dealer’s cards throughout the game. There are buttons on the dashboard from where you will either have to ‘Hit’, ‘Stand’, ‘Split’ and ‘Double Down’. The dealer will confirm your choice once you’ve clicked on one of the buttons. Dealer decides the winner: Once all the players at the table stand, dealer will take all the hands into account and announce whether the game is a tie or ‘push’, ‘win’, or ‘loss’, and who won the round. If your hand is closer to the value of 21 than the dealer’s, you win the value of your bet. If your hand total exceeds 21, you lose your bet. 1. Is live dealer Blackjack safe to play? All the casinos listed on our site that offer live dealer blackjack are licensed and reputed with stringent regulations in place. Most importantly, you get to see the cards being dealt by a real dealer, making it safe to play. 2. What are the odds I can expect? 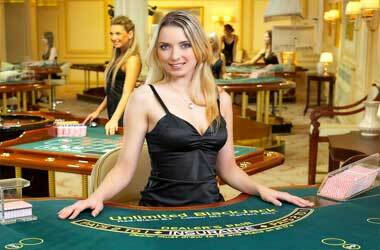 The odds in live dealer blackjack are usually the same regular play at an online casino. Since the game a low house edge, you definitely have greater chances to win more. The house edge ranges from 0.5% to 5%, depending on the number of decks. 3. Is it possible that live dealer blackjack games are rigged? At licensed casinos that are regularly audited and certified for play, which of course, you will find at Top 10 Casino Websites, there is no way any games can be tampered with. These games are subject to the same stringent testing processes. 4. Is card counting a reality in live dealer blackjack? Such practices are frowned upon by casinos listed on our site since it is ultimately their business that would suffer. The casinos on our list use a shoe of multiple decks and regularly shuffle the decks to mitigate the risk of players indulging in card counting. 5. Can I play live dealer blackjack on my smart-phone or tablet? There are a few casinos that have extended their live dealer offering to their mobile platform. As long as have a decent Wi-Fi or 4G connection, you can play live dealer blackjack anywhere, anytime. 6. Can I play live dealer blackjack in demo mode? Live dealer blackjack can only be played for real money. Some casinos may offer a tour or a short demo of how to play but for the ultimate experience you will have to fund your casino account with real money. However, most casinos allow you to watch other games in action, which is a nice way to see how things pan out before you go ahead and play with real money.